Back in 2001, the BBC’s Blue Planet offered a documentary that investigated what lies beneath the ocean’s waves. 2017’s logically-titled Blue Planet II uses new research and technology for an update on this work. After I viewed “One Ocean”, I feared Planet II would offer a tough slog through its six hours of material. As much as I appreciated the stunning visuals, “Ocean” came without much thematic consistency, as it flitted from one area/topic in a way that left it semi-incoherent. Don’t get me wrong – I don’t expect a taut “plot” from a documentary series like this. I know it’s not “real-life Finding Nemo", after all. However, I think each episode should follow some specific location or theme. Otherwise, we get a random collection of aquatic visuals without any clear purpose, and that’s the impression that comes from the opening episode. Happily, with “The Deep”, Planet II develops a strong focus, a trend that continues through the rest of the series. Again, these shows don’t follow clear “character arcs”, but after the first episode, they cover their themes in a lively way. The main attraction remains those amazing visuals, of course, and Planet II really satisfies in that regard. The shows look terrific, and they capture the broad variety of sea creatures in a vivid, engaging manner. Because I never saw the original Blue Planet, I can’t compare it to Planet II. 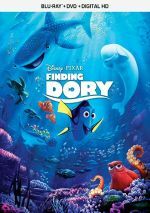 Nonetheless, I’m betting improved technology allows the sequel to expand on the original in a satisfying way, so this ends up as a fine look at oceanic life. 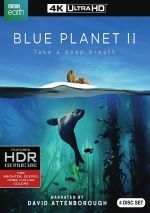 Blue Planet II appears in an aspect ratio of approximately 1.78:1 on these 4K UHD Discs. Despite challenging settings, these episodes looked wonderful. Sharpness seemed very strong. Most of the shows offered excellent delineation, with the only exceptions the result of the difficult filming conditions. Even with those, the programs boasted consistently terrific accuracy. I witnessed no shimmering or jaggies, and edge haloes remained absent. Of course, no print flaws materialized either. In terms of palette, the film went with the expected emphasis on “ocean blue”. These hues looked accurate and fit the natural settings well, and the HDR colors made the tones more dynamic. Blacks seemed deep and dense, while shadows were clear and smooth. The shows delivered a terrific presentation that was a joy to watch. While not quite as impressive, the series’ DTS-HD MA 5.1 soundtrack also satisfied. As one might expect, the soundscape stayed with environmental material to fit the ocean settings. This meant a lot of general ambience, though the action could heat up at times. In particular, storms and waves delivered a great sense of place, and the surrounds added kick to the proceedings. Audio quality was fine. Attenborough’s narration seemed concise and natural, without edginess or other concerns. Music was bright and peppy, while effects appeared accurate and full. Occasional instances of low-end – like the aforementioned waves – demonstrated solid depth and punch. The mix created an engaging setting for the sea-based material. A behind the scenes documentary called The Making of Blue Planet II: Into the Blue runs 51 minutes, 37 seconds. Narrated by David Attenborough, “Blue” takes us on location to see the work of the filmmakers. This turns into a perfectly serviceable overview. “Blue” can feel a bit self-congratulatory at times, but it still manages to convey the challenges experienced by the filmmakers, so it achieves its goals.